Fossil fuels are hidden and historically built into the core of the South African economy. Reforming fossil fuel subsidies might become one of the hardest parts of the country’s low-carbon economy transition. Redirecting fossil fuel subsidies is an obvious way to stimulate the emergence of a low-carbon economy and provide for social protection of affected workers. In the liquid fuels sector alone, South Africa’s fiscus hands fossil fuel producers between R6.5 billion and R29 billion per year, and forgoes between R35 million and R4.8 billion revenue through indirect subsidies, and this excludes the price support received by Sasol via the regulated fuel price. This against overstretched public expenditure of R1 671 billion in the 2018/19 budget. What government spends on these subsidies and loses in revenue would reduce the fiscal deficit of R180 billion (we pay a lot to service national debt). VAT was increased from 14% to 15% to raise an extra R16 billion revenue, which affects everyone’s pocket and the poor disproportionately. If the fossil fuel subsidies fell away, VAT could be reduced to 12.2%. 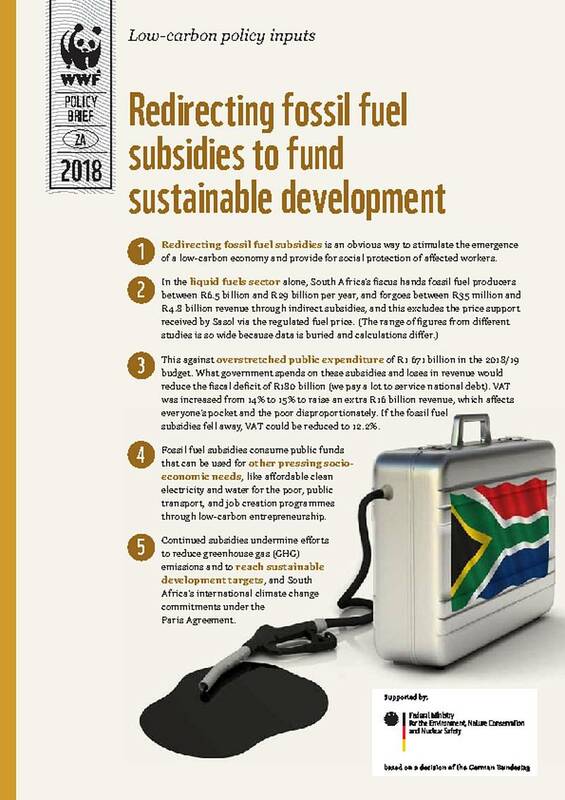 Fossil fuel subsidies consume public funds that can be used for other pressing socioeconomic needs, like affordable clean electricity and water for the poor, public transport, and job creation programmes through low-carbon entrepreneurship. Continued subsidies undermine efforts to reduce greenhouse gas (GHG) emissions and to reach sustainable development targets, and South Africa’s international climate change commitments under the Paris Agreement.